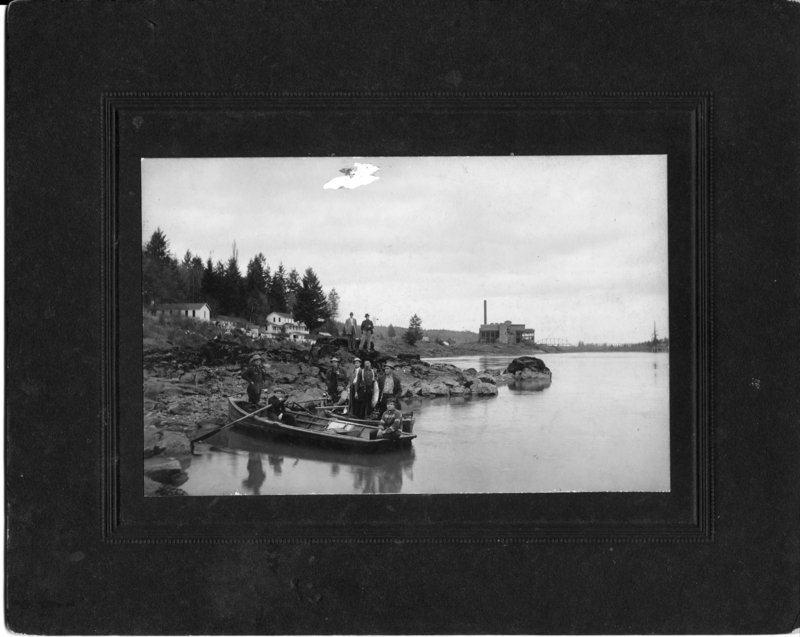 George Rogers Park boat landing, 1905-9. Boat on left, back seat Harry Headrick. Boat on right Ike Austin holding the fish, Raleigh Worthington, Ike Austin, Ed Erickson, Otto Larson, Willie Austin. Cement Co. Hotel by River for Cement Workers  of [unitelligible] OA#99. Transcription George Rogers Park boat landing, 1905-9. Boat on left, back seat Harry Headrick. Boat on right Ike Austin holding the fish, Raleigh Worthington, Ike Austin, Ed Erickson, Otto Larson, Willie Austin. Cement Co. Hotel by River for Cement Workers of [unitelligible] OA#99.